This is my first Post Secret Wars 2015 Marvel issue! We begin the first of two All New All Different Marvel titles (the other is Extraordinary X-Men) that I am guarantee to be buying. So fun to start on the ground floor with something like this. The Negative Zone. If you know anyone from here, you’ve made a huge life mistake somewhere. 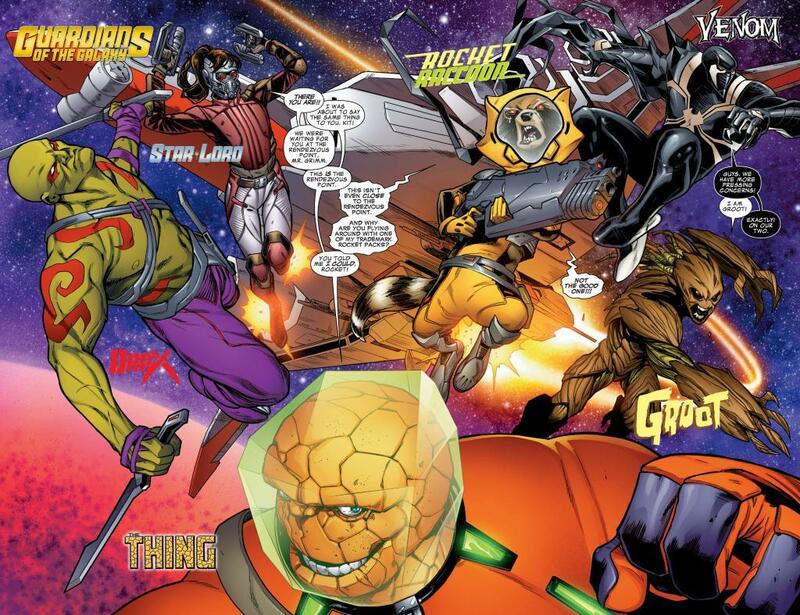 Annihilus and the Brood Queen are having a meeting, more were expected to join – the rest of the Kings and Queens of the Galaxy. Even though eight months have passed, it seems like none of the power vacuums have been filled. J’Son is out of power (and Peter Quill didn’t get the invite, I suppose), Supreme Intelligence hasn’t recovered from Black Vortex, Gladiator seems to be ignoring the invitation and the Chitauri were not invited. So of the entire galaxy, there are only six people to make up the Space Cabal. Without missing a beat, the Brood Queen wants to split the galaxy in two. The Milky Way Galaxy. Home to a lot of things. Including you . . . and all of your stuff. Totally worth guarding. 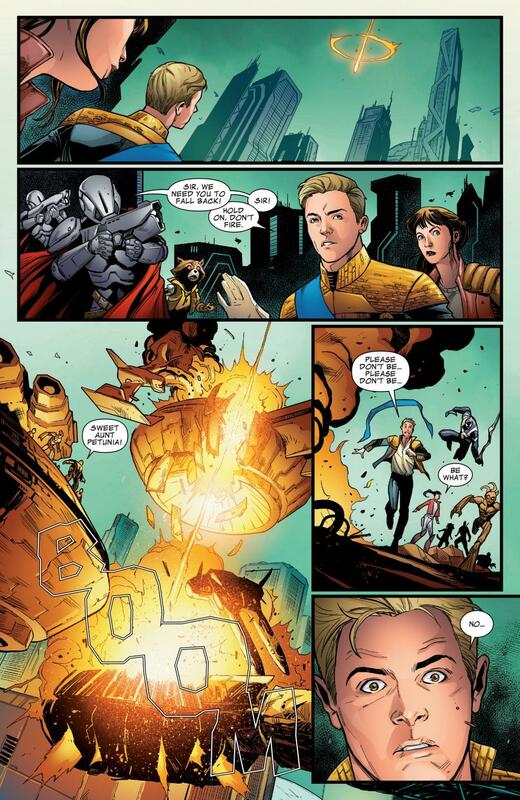 Bendis shows up, right away, that he totally gets Ben Grimm – formally of the Fantastic Four. He always wanted to be an astronaut. Sure, Reed took him to alternate dimensions and timeless, even space on an occasion – but Grimm has never had an etensive stay in space. 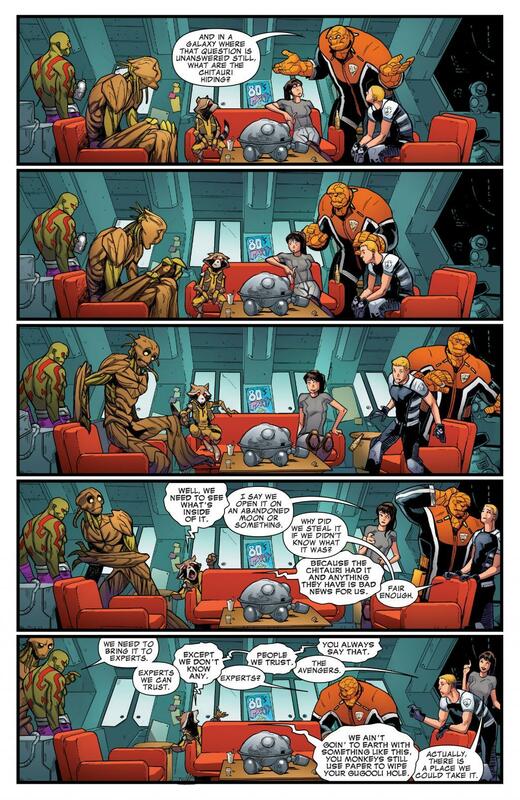 Well, on the original Battleworld – Post Original Secret Wars. Grimm is fighting a Chitauri horde. 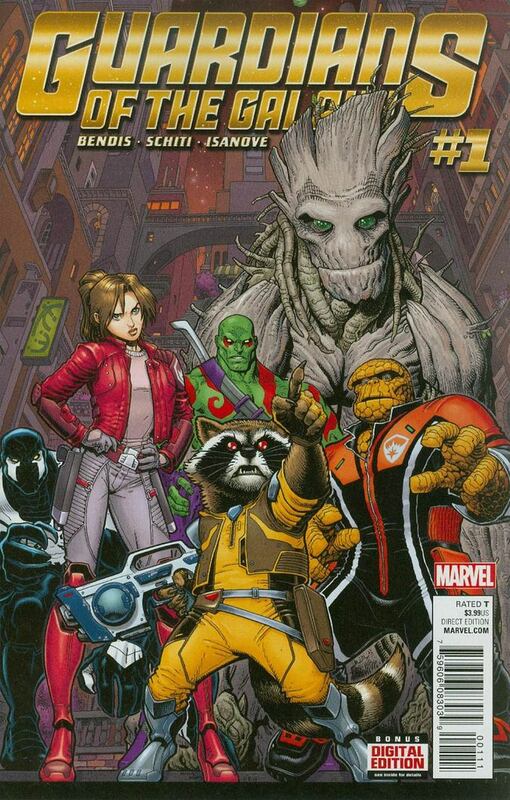 When he needs them, his new team arrives – The Guardians of the Galaxy! I love how classic Marvel this page feels, with all of the heroes getting their logos shown. 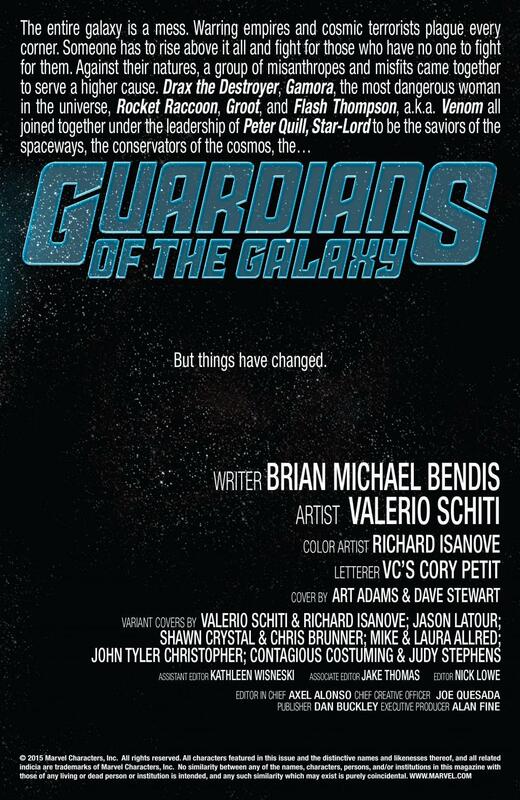 I wish Kitty as Star Lord, got a different font or something. She does look great, in the new (old) gear. Schiti just plain slays this issue. Grimm calls her, Kit – which I’m cool with. These two being on the same time, feels like a long time in the making. She calls him, Mr. Grimm, which I sort of like. I remember, as a youngster, calling him, The Thing, and my mother telling me how that is a horrible name. 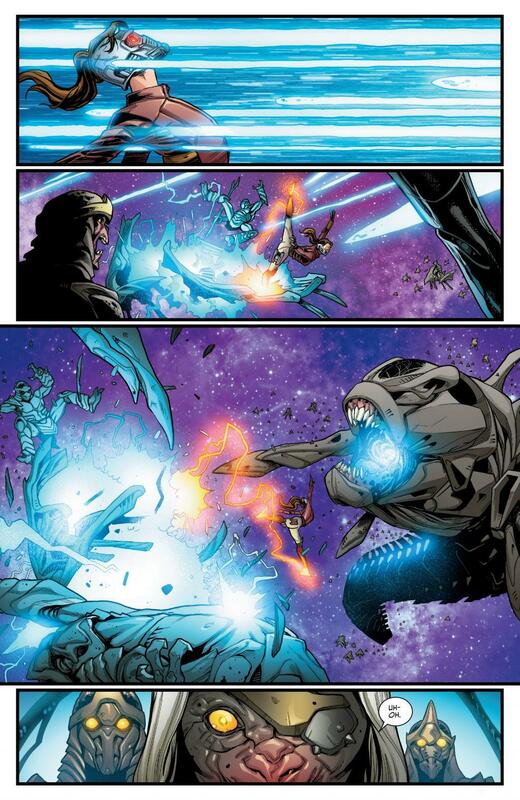 Groot looks like he still has his power upgrade from Black Vortex, even though he gave that power up. Grimm is in one of Rocket’s rocket packs – one of the good ones, which upsets Rocket. Rocket, who is the leader of the group now- from what all of press and interviews stated – asks if they are going to do the thing. Kitty is fine with that plan. So there is a story of Kitty joining the team, prior to Thing joining, that I really want to read about. Kitty phases through the energy attack, forcing it to be rerouted. I love seeing what Kitty can do, if she is given the opportunity to do so! Kitty is now playing on a larger scale, and she has the power to do so. 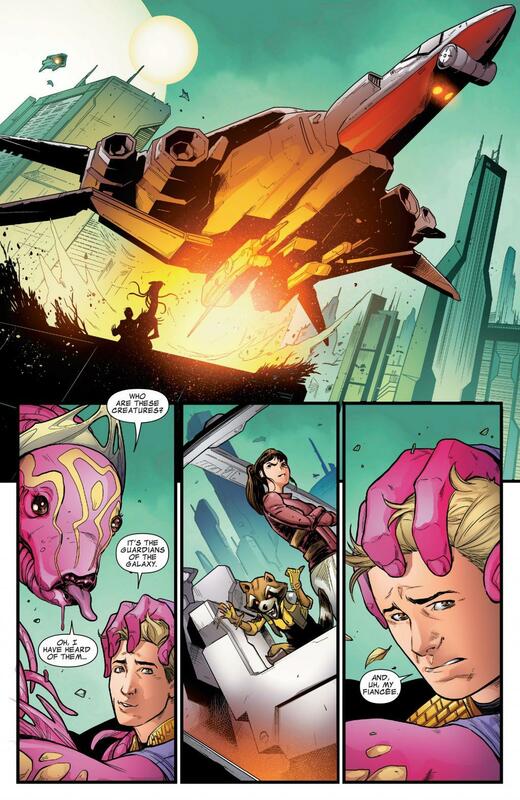 Venom, is still learning what Pryde can do – so they couldn’t have been together for that long. Or his solo series, is keeping him from the title, for periods at a time. Flash is curious why she doesn’t phase through her clothes. Rocket, quickly, points out how Flash is wearing alien goo and he doesn’t question that (to his face). 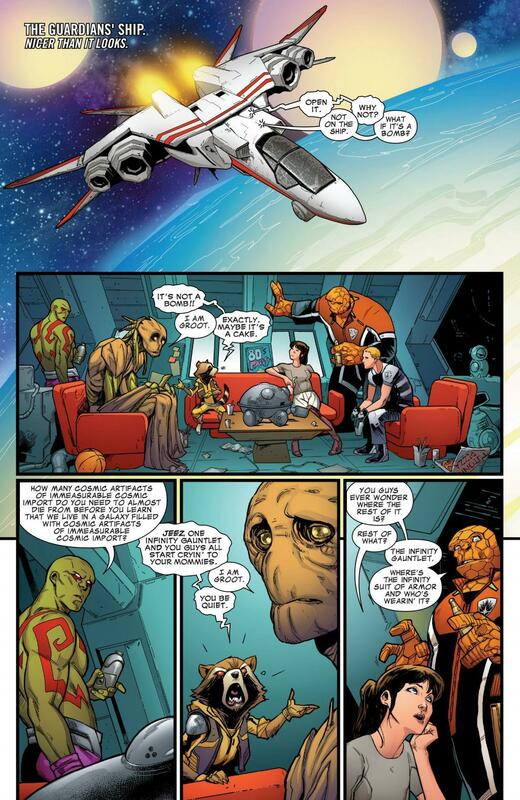 Drax, like everyone should be, is very impressed with Pryde. Rocket really likes this new Star Lord. 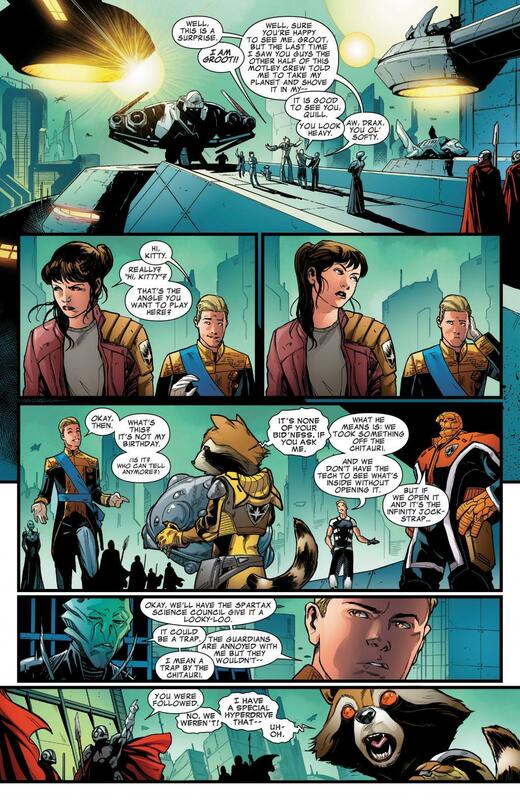 Drax wonders how the old one fares, whom Rocket calls “the fancy boy king.” Rocket isn’t that impress with Quill. Planet Spartax. It’s Damn Nice. Quill is in yet another board meeting, losing his mind with boredom. Quill starts to stand, when his main adviser asks where he is going, he doesn’t have a good answer. The adviser knows what is happening and assures Quill that the meeting is almost over. If a few hours, can be translated as almost. This probably explains why his own ongoing, is a flashback story. The Guardians’ Ship. Nicer than it looks. I’m hoping this series has plenty of these scenes. The team has an alien artifact and don’t know how to open it. Grimm brings up a thought, that I’m sure he has been wanting a share. If there is an Infinity Gauntlet, shouldn’t there be an Infinity Armor? Schiti does great action sequences but can make a page of team dynamics swing, as well! I’m not all that aware of what the Chitauri do. I know in the Ultimate Universe, that is what the Skrulls were called – and “Skrulls” being a racial slur. They are also the alien threat in the first Avengers film – that sums up what I know. So I also don’t know what’s in the box. WHAT’S IN THE BOX!?! Great use of two silent panels, the team having the same thought an same reaction – to hide behind the furniture. Rocket wants to open the box. They don’t have any experts, on call – so Drax’s idea doesn’t work. Flash wants to call the Avengers, like he always does (apparently). If Rocket doesn’t want to go to Earth, Kitty has a planet they can go to. I sort of want these few pages to be acted out. I never have that desire, with any other writer – besides with Bendis. What they are not saying, speaks volumes. Planet Spartax. Again. President Quill is having a meeting with a pink alien queen (who is all neck). She wants to procreate with him, it makes sense, to bridge their two planets. She licks his face, as company arrives. Quill confirms that Kitty is still his fiance – but they do seem strained. 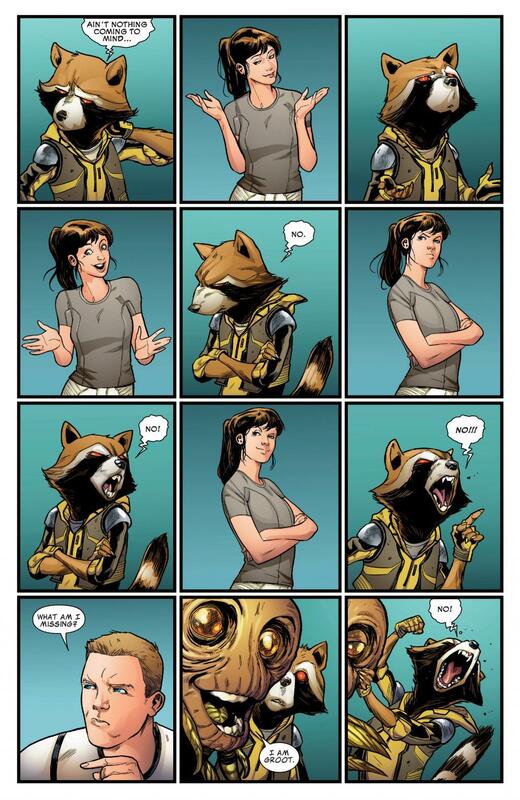 Look how excited Rocket is to point out that Kitty sees Quill and the other alien, together. Quill hints that Rocket and him had a falling out. Pryde is clearly angry or annoyed with Quill. Rocket doesn’t want to share any details with Quill. Flash explains why they are there. Grimm is still going on about Infinity Jockstraps. Quill’s adviser doesn’t like the idea of helping the Guardians. It appears that the Guardians were followed. The red hot light crashes down to the planet’s surface. Quill seems to have a suspicious of what or who it is. 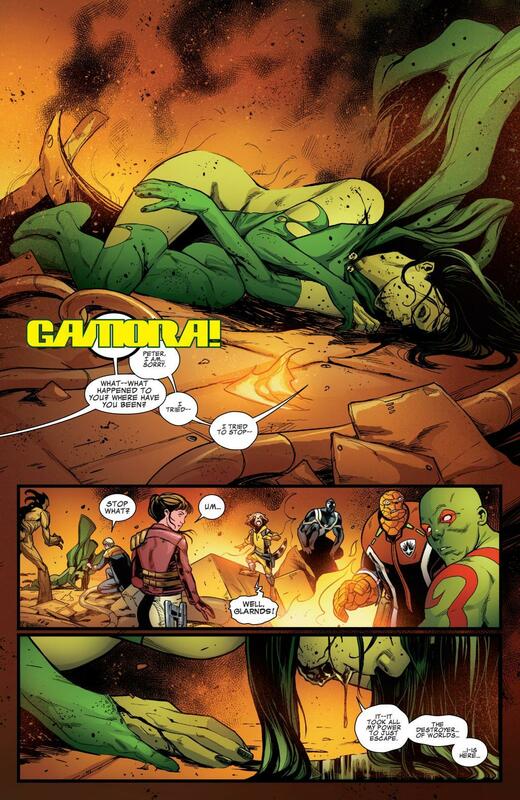 Gamora is back! She, like Kitty, doesn’t appear to have kept her Black Vortex upgrade. 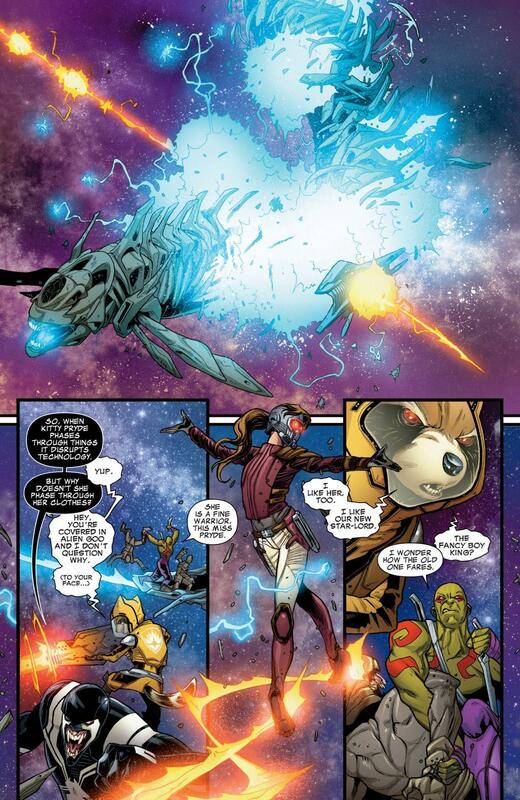 Gamora mutters that it took all of her power to escape, to escape from the destroyer of worlds. 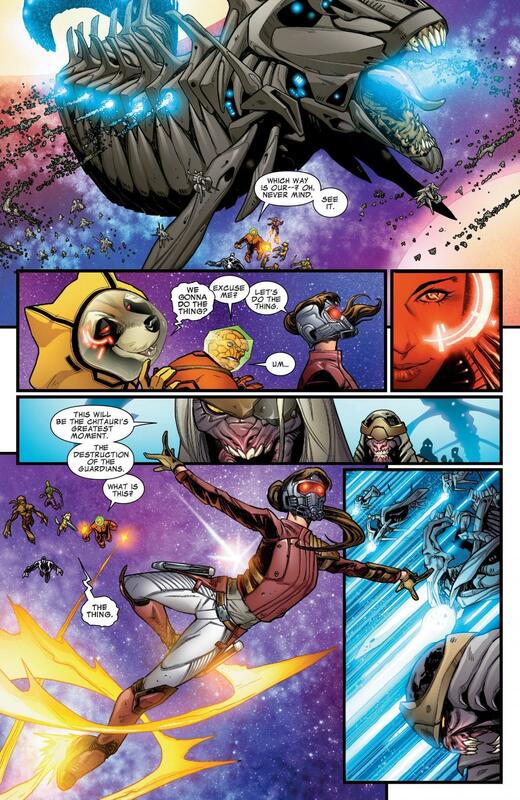 The final page reveal, is that it isn’t Galactus but Hala, and she is here to destroy Spartax. Such a great first issue! I have so many questions but I’m sure they will be explained, eventually.